Japanese angler Genki and two friends visited the Mae Klong River fishing for Giant freshwater stingrays. The anglers were soon fishing down stream of the town with floats deployed at intervals across the river. Several hours passed before one of the baits was picked up and the float began to move off. On winding down into the stingray the rod took on a healthy curve. A short battle followed with the small stingray overpowered by the heavy duty big game equipment. The Giant freshwater stingray was estimated to weigh 30 kg and was quickly released. The anglers fished into the afternoon and lost a much larger fish after a 1.5 hour battle. 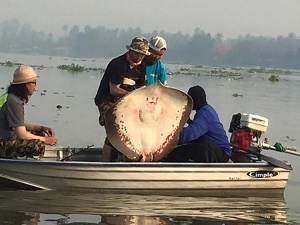 Towards the end of the day the anglers managed to land two further Giant freshwater stingrays of 35 and 40 kg’s. All stingrays landed were small males.